US Secretary of State John Kerry arrived in the South Korean capital, Seoul, yesterday on the first leg of a three-nation East Asian tour dominated by escalating US threats against North Korea over its nuclear program. Kerry arrives for talks today in China and is traveling on to Japan tomorrow. Kerry did not spell out how Washington plans to halt North Korea’s nuclear program and force the North Korean regime in Pyongyang to give up the weapons it has developed. Over the last several weeks, however, Washington has signaled its readiness for nuclear war. It has repeatedly flown nuclear-capable B-52 and B-2 stealth bombers to the Korean peninsula for military exercises. At the same time, it has deployed additional missile batteries and warships to the region. 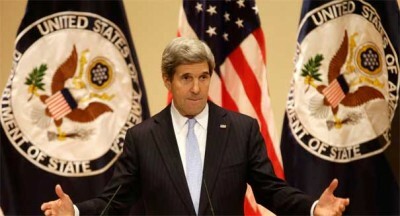 Kerry also warned against North Korea carrying out missile tests, as Pyongyang had said it might do on April 10. The deadline passed without Pyongyang launching a missile, however. This was apparently a reference to China’s ability to starve Pyongyang into submission, by cutting off critical fuel and food supplies to Pyongyang, which relies on Beijing as its sole regional protector. Kerry also repeated denials from the Pentagon and US Director of National Intelligence James Clapper of a report from the Defense Intelligence Agency, which claimed that North Korea had developed the ability to deliver nuclear weapons via ballistic missiles. Kerry noted that there was no evidence that Pyongyang had miniaturized a warhead and was in a position to launch a nuclear missile at the United States. Any serious examination of Kerry’s comments refutes the hysterical presentation of the North Korean crisis in the Western media, which cite Pyongyang’s threatening rhetoric as evidence that North Korea poses a clear and present danger to the United States. In fact, North Korea is a desperately poor country of 23 million people, whose economy has disintegrated over the last two decades. It was devastated by the cut-off of Soviet supplies of energy and industrial parts, notably for North Korea’s agricultural machinery, after the collapse of the USSR in 1991. Vindictive US sanctions imposed on North Korea have compounded the devastation. Amid chronic famine and drug shortages, North Korea faces raging epidemics of multi-drug-resistant tuberculosis and of severe malnutrition. According to the UN, one third of North Korean children under age five show signs of stunting. The North Korean regime, facing constant threats from Washington, has developed nuclear weapons as bargaining chips in its dealings with the US, also apparently calculating that they might deter a US war for regime change, like those in Iraq and Libya. North Korea’s nuclear weapons are, in the final analysis, comparatively minor factors in the regional military situation, which is dominated by the US confrontation with China. While Pyongyang has clearly had nuclear weapons capabilities since it first carried out a nuclear test in 2006, Washington only began to threaten war over the issue since last year’s so-called “pivot to Asia,” aimed at containing China. This offensive aims not only to intimidate China into not using its financial leverage against US policy—Beijing holds over $1 trillion in US government debt—but also to whip Beijing into line with US imperialist interests, notably in the Middle East. China has blocked UN resolutions aiming to legitimize a direct US intervention in the US-led proxy war in Syria. Beijing also opposes US plans for war with Iran. As Washington intensifies its campaign against Pyongyang, it is simultaneously threatening Iran—also ostensibly with the aim of halting that country’s nuclear program, which Iran insists is for peaceful purposes. Washington slapped financial penalties Thursday on a Malaysian bank, the First Islamic Investment bank, for financing Iranian trade. The US campaigns against North Korea and Iran are based on political lies, in particular the claim that these countries pose imminent danger of nuclear war. In fact, the main danger of nuclear war arises from the United States, which has threatened pre-emptive use of nuclear weapons against any government that seeks to develop nuclear weapons without US approval. American imperialism is escalating these conflicts in defiance of deep-seated antiwar sentiment in the American working class, which it intends to make pay for the US military build-up. While Washington plans to spend $352 billion over the next 10 years to modernize its strategic nuclear arsenal, according to a report by the Stimson Center, the White House is proposing $400 billion in Medicare cuts over the same period.